Looking for a shower filter that reduces impurities like chlorine, is safe for baby use and helps improve skin conditions such as eczema? 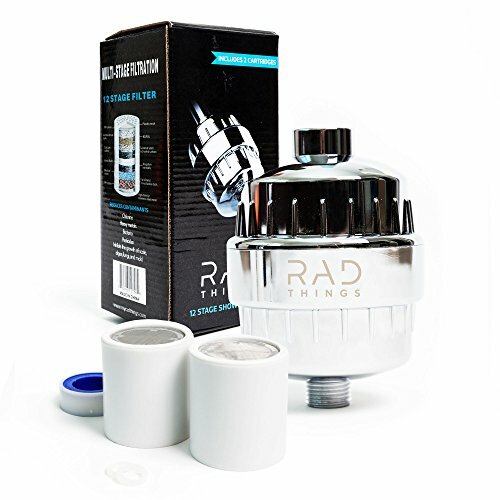 RAD Things 12 stage Shower Water filter does exactly that and so much more. The best part? it does all this without reducing water pressure! RAD Things shower filter can be used for handheld shower and rain showers. What's more is our water filters come with two cartridges (one in the holder and a replacement cartridge) each of which can last you for up to six months. So you don't need to worry about a shower filter replacement for one year! Our shower filters are backed by our manufacturer's 30 day money back guarantee and 1 year free replacement warranty. Click on the add to cart button to get your RAD Things 12 stage shower filter today! Comes with 1 additional replacement cartridge and each refill can be used for 6 months or 12,000 gallons so you do not have to worry about a replacement for a whole year; designed for universal use so it can fit into any handheld shower or rain shower system and is also portable if you wish to take your filters with you when travelling. If you have any questions about this product by RAD Things, contact us by completing and submitting the form below. If you are looking for a specif part number, please include it with your message.